Paul and Viri welcome you to Damson Lodge. 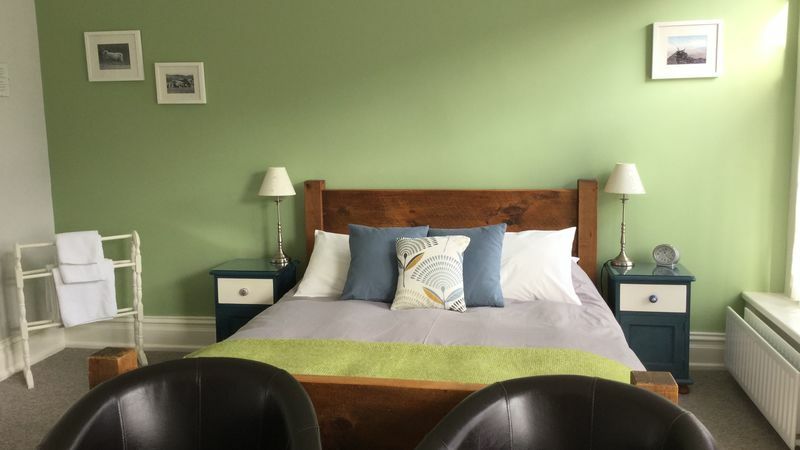 Right in the heart of the market town of Keswick, at just a four minute walk from the main square with all its shops, cafes, bars and restaurants, yet in a quiet location, we welcome you to our tastefully refurbished Victorian B&B. The shores of the stunning lake Derwentwater, with its boat landing and its famous Theatre by the Lake, is just a leisurely stroll away. For those of you who are itching to venture out walking, the mountains are literally on our doorstep. Well, maybe not literally... but you get the idea. You can leave your car behind and enjoy several days of stress-free walking straight from the door. If you fancy exploring the area on two wheels, we provide secure bike storage. For those of you who like to stay connected with the rest of the world whilst relaxing, free WIFI is available throughout the house. To prepare you for your chosen activity, we like to set you up with a good breakfast. Our menu has a variety of choices, from the hearty full Cumbrian to Craster kippers, vegetarian options and the daily special (typical examples are pancakes, eggs benedict, Solway shrimps and smoked salmon, amongst others). All our bread is home made by Paul's fair hands. We are committed to sourcing the best quality, and wherever possible local, breakfast ingredients. We are also more than happy to cater for any special diets on request, such as vegan, gluten-free, etc. If you are planning to book tickets for Keswick's Theatre by the Lake, please let us know in advance as we can provide you with vouchers which entitle you to £3 off per person. Finally, we have lived and worked in Keswick since 2005 and we love walking, so we are very happy to share our knowledge of the area with you and lend you any relevant maps, so that you can enjoy many wonderful walks. Whatever your reasons for visiting the Lakes, and there are many, we feel sure that you'll enjoy your stay with us and we look forward to meeting you. Why stay at Damson Lodge? Free on-street parking, with no restrictions. Discount vouchers for Theatre tickets available.